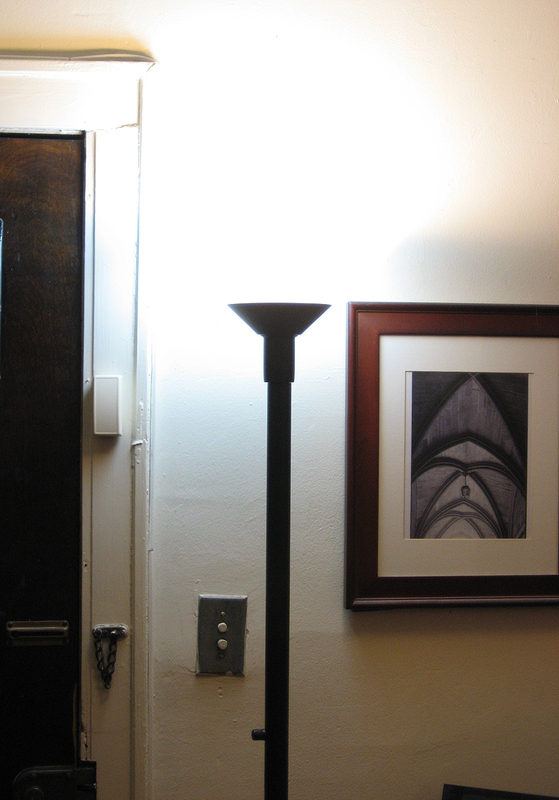 Compact Fluorescents are all hot right now. And it's Earth Week. I bought a floor lamp from Home Depot that used a single standard bulb and didn't have any fancy dimmer system: it just had a hi/lo switch (I'm still not sure what it does with it--the CFLs flicker on the low setting, so I quickly turn the lamp to high when flipping the switch. It could be a simple rectifier to provide 50% of the power). I then bought three lamp socket splitters. These screw into a standard lamp socket and provide two sockets. So, with three splitters, a single socket becomes four. 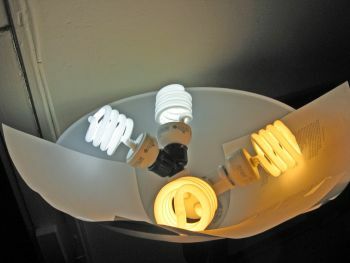 This is OK because the CFLs use so much less power--with four of them, I'm only using 100W, and the floor lamp suggests using a 150W standard bulb. The sockets themselves are rated higher, so I think the 150W max is for thermal/fire issues (high wattage bulbs can start fires if drapery or other flammables fall on them). Taking pictures of lighting fixtures is hard--either the fixture looks dim and the room dark, or the fixture is overexposed. 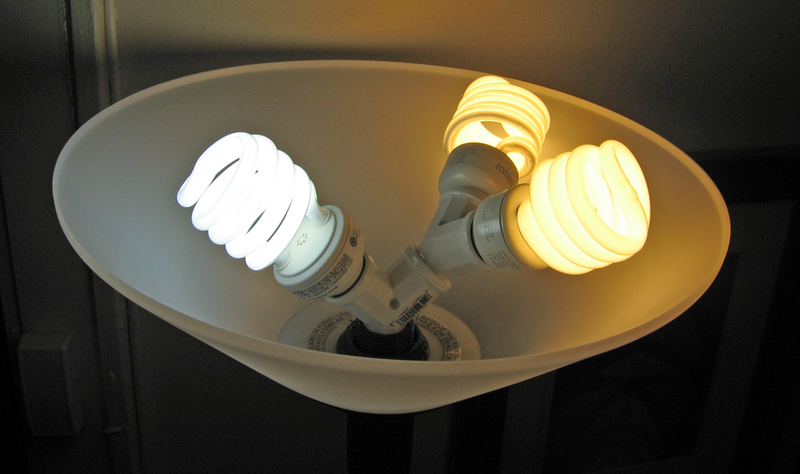 If you think the color temperature is off, you can adjust by using different color CF bulbs. Here was an experiment with a 2:1 warm:daylight ratio. an even ratio between warm and daylight. This was too cool for evening use. The color is way exaggerated here--the yellow bulbs are nearly white to the eye. The color of the photographs is too strong--your eye does not see such strong color in the fixture. In any case, I made this fixture 100% n:vision 100W soft white bulbs, and use it all the time. I have a second fixture where I replaced the dimmer switch with a standard push switch (it's tough to find a switch that fits in small diameter torchieres) so I could use compact fluorescents in it. I put 3 GE 100W daylight bulbs in the latter fixture and use it only during the day. Now the caveat: the splitters stick the bulbs higher than where an incandescent would be in the fixture. Ideally the rim of the lamp shade would be a touch higher, but I've yet experimented with the right material to make one. 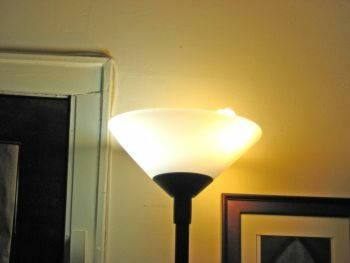 Doing so would improve the fixture and reduce glare from it. The end result is I've increased the lighting in my otherwise dark apartment (north facing windows on the first floor) and decreased my lighting energy usage by 50%, even more on average since I don't use the second fixture at night. I'm already being paid back on my electricity bill: some $10 a month less. I also used to have a 55W fluorescent dimmable torchiere, which wasn't quite as bright as a 300W halogen, but the separate ballast went bad so I stopped using it. With the lightbulb colors, it is fairly easy to look at the spectra using common household objects.